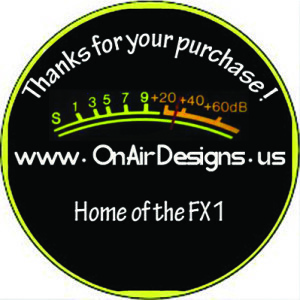 Welcome to On Air Designs, your one stop shop for Cb radio Pro Audio Interfaces & accessories and other cool stuff. Our best seller The “FX1 PRO” is an interface that allows you to connect PRO Audio devices with your CB radio. You can connect PRO XLR Mics, Audio Mixers (what Radio Station engineers and professional vocalist & musicians use) and all kinds of other external audio gear with ease. I’m dedicated to giving you the best products with a focus on dependability, customer service and product uniqueness. My love of Pro Audio goes back years now, and I’ve always enjoyed making outboard CB/Ham gear & gadgets for fun. After working on some designs, I wanted to share these with others. I pride myself on superior construction and solid parts. Each unit is high-quality and tested to ensure it will work great for you! I am a registered business with the State of Pennsylvania, and you can feel confident in your purchase with my secure checkout. I ordered the FX1 Combo Pro from On Air Designs, and it was beyond my expectations. I had a few questions to ask via email, but Rich took the time out of his schedule to call me and address them personally. What a guy! Got it along with a Behringer 802 mixer and a Shure SM58S microphone. After talking with Rich, within about 15 minutes playing with it, I had it where I wanted it. Thanks for not only a great product Rich, but great one on one service.